The 21st century worldwide growth of forest simulation is much about thinking about the consequences of CO2 in the atmosphere. So for a simulation like that, so many influencers, what do we have to consider? Sunshine, Atmosphere, CO2, fertilizer, Glass effect, Clouds, Rain, Growth of Forest, Siberia, Green Land, Plants, Trees, Animals, and finally, Human beings and technology. It’s all about the Details, the holy grail of detailed know-how possession. First of all, as for fossile ressources, we’ve researched resonable information for weeks, just to dig up a few proven numbers. What we found was rough estimations. So in using this very simulation model, we can learn a lot about the holy grail search. Be modest, that’s good for you, that’s good for others, as well. Less greed, less decadency, and all of a sudden, our nature is gonna be fine, as well. In 21st century, we don’t need cars, we don’t need greed, to survive, hurray. As we got so much time now, so much time, to make friends with one butterfly, one whole free day. Or write an application as simple as this, in all our free time, in being Founders of 21st century. Much better than flying in Airplanes all over Greenland’s melting coast, to day. Just to write one more report, one more report so useless in history. As if you’d look, if you’d look how many open ends there be in this very simple simulation today, you’ll see how much more useless formula they create when building simulations of ultra complexity. World’s details are endless, that’s what we here say. So you better make up your own mind, today. It’s free of charge, anyway. What we say here is that climate change is good for nature, as we’ll see a large new manifold of species, and Planet Earth has seen so many worse times before, we find ourselves in a self-regulating circle already. Only for mankind, with industry, business, welfare and bureaucracy, we see that too fast change could mean a lot of harm, that could be avoided if we all just live in a bit more modesty. So in the end, you gotta decide if Participation is one of your core values (ecologist), or you are just wearing a green jacket but believe in mankind’s victory (anthropologist) over nature. So while the ecologist welcomes the natural change, and sees human caused change as merely natural (one world of participating species), the anthropologist merely believes in primate and secondary species, so that all secondaries shall serve the primates, and be eaten, killed, or surpressed, for example, for reasons of farming and for optimizing net profit in industrial food production. Well, of course, win and loss. That’s what we learn from nature, if you believe in religions of all kind, sciences of all kind, or even both. at Dynamic Applications, we believe in participation, and the uttermost fair and even, strongest level of participation is of course not sitting around in infinite boredom of universities on the backs of the working class, all day, but rather to experience all that beauty, all those wonderful interactions of nature and man kind in your own very garden. May it be Butterflies, Ladybugs, Ants and even snails. Not everything may suit you on your Table, so whenever you’ll have access to god’s own environment, we shall have at least one small, completely natural peace of wonder’s garden. Then, we cam do as well a little agricultural gardening for food, as well. Of course, participation with nature, in its ever so beautiful diversity, that’s best to achieve, in all our wonderful life of modesty. Still, that’s just my 2 ct, so as always, we’ll leave that up to you to decide. Ice Bears, the poor? – well, well, so parties around even call themselves green, and then, they agriculture so much greed, they let dye refugees in mid mare’s sea, just to win more of their dead, and empty, big field. From the aspects of nature, life and death belongs together, so at Dynamic Applications, we believe in that you shall rather life a good, fine, decent life, than to destroy what’s god given to be, to us. So let’s enjoy all that we see, and believe me, i see before me thousands of years gone by, bye bye, le feel D, we say, and still we see one brown bear tapping on that unknown stuff again that we now call ice and snow. And that’s what i call proven from history, as if you look closely, 5000 years ago, there was one guy called Noah, oh, how did her enjoy, the greatest Pirate on earth, he saved them all, living together with plants, animals, children, men and wifes, did not he have a wonderful life. And so we see that we now all can relax a bit and say, well, well, that’s what we learn from history, good plan is 4 more years, and all beyond we may as well call scientology. Just my 2 ct! In case you wanna know what kind of guy i am, now, why don’t you look at test i did to find out about all of my believe. Reflect, i say, and learn from thee. And a bit, small part of that strongest ever Pirate, Noah’s arc, we find to day in Pirate flag, around the world of green party believer’s nightly child mares, soo very Pirate children before me i see, why don’t you join and enjoy life with me, in modesty. And well, you know, how child is made, that’s what we call here all protected, in you bed room’s privacy. So unfortunately, i couldn’t talk about that! You gotta go ask goo goll’s monster of paid truth. Ok, ok, you gonna say i cheat, if i move forward in your head one single thought. So i better stop and wish you a good nite, tonight it seems i couldn’t find some sleep. Hm, hm, sometimes, best thoughts appear to me in early morning, when all around god’s wonderful landscape i hear them calling, my lightweight friends of bride, singin to me from all those nearby, wooden trees, we haven’t had to carve away in an attempt to resist greed. And so we see a wonderful, just wonderful big (P) right next to our own house, and father said we children may as well visit those trees, as everyone else, around here in good ol’e germany, country of big strong oak and beech, what we call here the eiche und buche Tree. And so we measure here in sympathy with what i write on 21st century, from grains of sand build reflecting me books of 21st century anthropology. I say that nature, up from ants and even beneath, would probably tell us their very own, best ever theory, of why they think all species on earth shall be wild horses, wolves, or fox hunt funny bunnies on the field. Cats, mice, the mickey mouse of me, i am so small i most enjoy the lightmost elements we see, in what’s called birds who bring up children from small eggs. Enjoy your break fast, i say, and why don’t you try dig a hole place all kinds of some fruit there in and try to find out which of these may suit you well, some day. The 21st century worldwide growth of Forest simulation will empower you to make up your own mind, based on facts and logic. You don’t believe in a number, a formula? – go ahead and change every formula, integrated live within the application. Free Promo Codes on Twitter, world’s fastest network, will empower you to activate the integrated Formula editors. See The Dynamic Idea and Roadmap Voting Competition for more. Learn sustainable thinking by checking out dependencies between fact, effect, logic, cause and origin. School’s know-how, and a small book of old, proven laws of nature, all you need. To prove anything in itself, and show the proof of concept, we decided to go with the deliverable ressources per year, under today’s technology and market conditions, as we have it right now. As there is more grains, water, mesh and sunken trees in the earth und under the oceans than we might even know today, we let that value rise by about 1% per year, as the startup setting. It’s only a default – change anything as you prefer, and see the consequences. we concentrated on simulating a few, fairly well known things. All Input Values and Formula, where suitable, are based on Wikipedia sources and articles, which contain further weblinks for public research. See bottom of this page for a list of references and sources. Our Planet as a whole, in neverending balance. 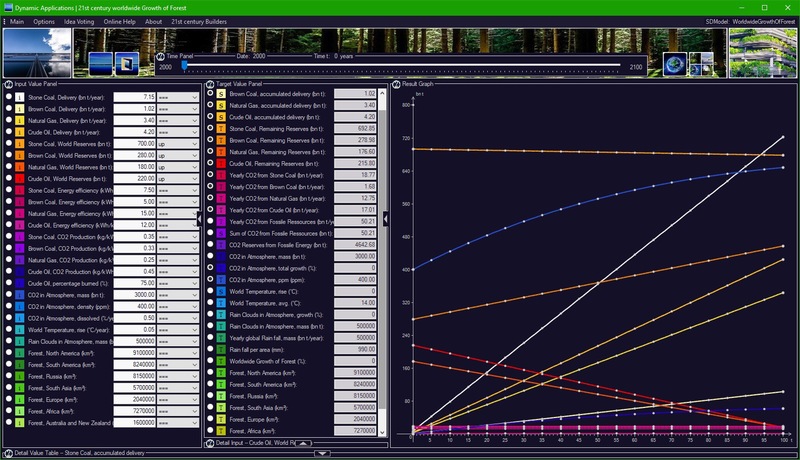 Introducing the 21st century worldwide growth of Forest simulation. Our simulation does not intend to provide the singular world formula, neither do we have the capacity nor would be so arrogant to claim we have got the knowledge to do so. It’s just an overview of a complex system of interacting nature, climate and weather, in a top-down approach. It should rather be an easy enough starting point for everyone interested in the topic to check it out, yourself. 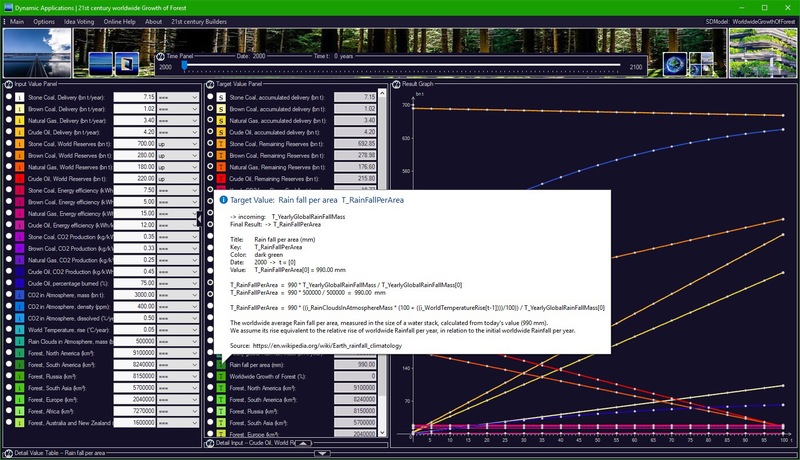 By concept of the Dynamic Applications platform, all parameters are publicly visible through ToolTips, with formula and live calculation values. Instead of just showing a few numbers and fancy diagrams as you can find all over the internet, here you can make up your own mind. Rain Forest. Nature’s Treasure in global resources, woods, animals and clean air. For each ToolTip, we’ll be adding a hand-written comment to explain what this value is about, where we got value and formula from, and cite the Wikipedia source. As usual, for everyone interested in adjusting the formula systems, there’s promo codes around on Twitter to activate Perfect Desire, our professional simulation platform, for free. It’s part of the game. So this very simulation comes with a built-in formula editor. Get your own picture, as of today. Let’s hunt them green scientists, do some work, instead. so they need no super bio shop to pay. That they give all that money, back away. Much less airplanes, much less airplanes, to sunny green land, one day. How much nature, how much beautiful nature, how will then say, hurray, mhm. When plants can breathe more, can breathe one per cent more CO2. with a forecast based on System Dynamics. Softpedia Award for a 100% adware and spyware-free download!. freely configurable Start Date and Simulation Time (10..240 years). We develop a standalone client, here. Precise. Pure. and Safe. 21st ct worldwide growth of Forest. 21st century worldwide growth of Forest is copyright (c) 2016 Martin Bernhardt of Dynamic Applications. We guarantee you a free 1-year-license. And we’re here to help. All our Windows 10 Store Apps come with full functionality, including the Target Formula System editor. So there’s no need to apply Promo Codes on Windows 10 Store Apps. 21st century worldwide growth of Forest. Grow your Input. Show your Target. Think. Living in Nature. Dependency. Understanding. Living in Balance with Nature. Rain fall per area in a year, calculated from evaporation and Temperature. For this simulation, we’re referring to Wikipedia in german and english language as a reference. Further pages researched have been used as an additional resource to set up values and formula, but in the end, as of the mssive number of ressources, we decided to rely on Wikipedia, only. how many open ends will we find, when adding one more formula of choice? Think self, here we say. That’s key one question to solve. Sharing is Caring. So this simulation model is much about living on the backs of others, you and me. As it serves a good purpose, and to feed the poor, this simulation model is free of charge. We vote in online democracy, we deliver for free. we work for you, and we call them& Dynamic Applications.